Hot dogs are a great dish for backyard entertaining. Kids and adults tend to love them, they are easy to grill, and they’re pretty much a no-fuss kinda thing. But…what if you actually want to fuss a bit this year? What if you’ve seen the light and understand that your hot dog can be a holding cell for a bevy of delicious toppings that go well beyond the usual suspects of ketchup, mustard, or sauerkraut. 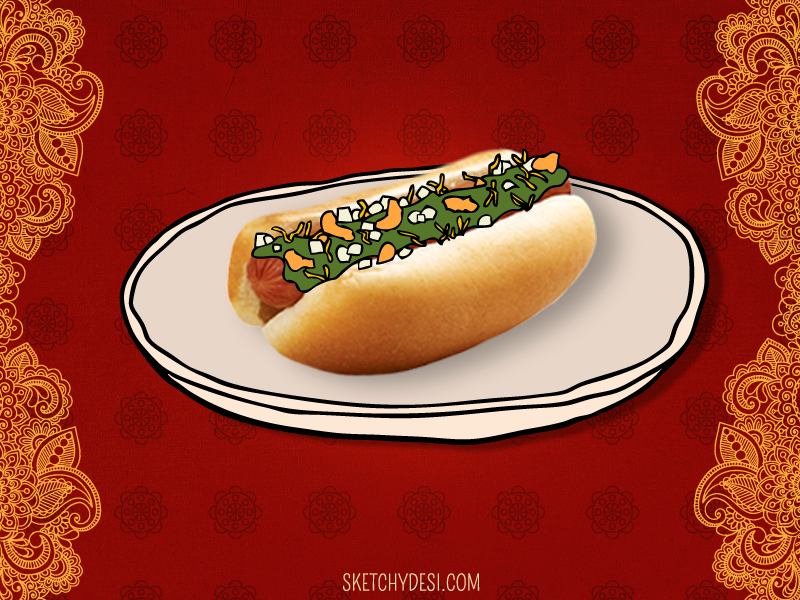 I’ll be “frank” – I’m not the first to propose an elevated hot dog nor will I be the last. Every summer, cooking publications suggest throwing an elevated “haute dog” party with a smorgasbord of condiments and toppings that might include exotic relishes, pickled vegetables, homemade slaws or gourmet cheese. And though I appreciate the suggestions, I prefer my upgrades to be more masalafide and textured. After all, if hot dogs are traditionally paired with sauces and pickled goods then HELLO, achar and chutneys are natural, albeit punchier, options! Think I’m reaching too far? We need only look to a trend that has become popular in both the US and Canada over the past several years: Japanese hot dogs. Restaurants and food trucks such as Japadog and Tokyo Dog have taken the ubiquitous American street food and upped the ante, offering some seriously delicious and novel toppings. We’re talk about a variety hot dog links and sausages topped with anything from teriyaki sauce, chili sauce, miso, seaweed, bonito flakes and more. And if that wasn’t genius enough, some places even offer tempura battered sausages! To say these mashups work is an understatement. Taking a cue from these creative trends, why not desi up your hot dog at the next BBQ you host? Your local desi grocery store will come in handy to stock up on some ingenious toppings! But first, some reminders. You should not compromise the actual integrity of your meat just because your hot dog is going to get some serious dressing. I suggest using a good quality link/sausage as your base along with toasted buttered buns. The trick to making your hot dog party appear more elevated is by making a buffet station of toppings so that guests may mix and match as they please. Laying out each ingredient in separate bowls looks more appetizing than leaving out a bunch of bags and bottles! When going shopping for toppings, consider ingredients that would taste good for chaat, such as an assortment of chutneys; mint and tamarind make for great hot dog condiments! You could even put these in squirt bottles for extra swag. Other chaat-inspired toppings that would deliciously dress a dog are sev, boondi, and Bombay mixtures. Crushed chakli and papri would lend a tasty crunch as well. Your buffet could also include diced tomatoes, onions, chopped coriander leaves, and herbed dahi. A variety of achars on your line-up work as well! Want to take it a step further in the wow-factor? A batter that tastes surprisingly delicious with hot dogs is besan! It’s akin to corn dogs but with a nuttier taste. Worth noting is that recipe is gluten-free as well. combine: 1/4 cup besan, 1/4 cup arrowroot powder, 1/4 teaspoon baking powder (grain-free) and ½ teaspoon EACH of the following: turmeric powder, cumin powder, onion powder, and chili powder. Beat one large egg with 1/4 cup sparkling water and about 1/8 cup milk. Combine the wet ingredients with the dry ingredients to make the batter. This batter will coat about 6 medium sized links. Deep fry it in oil and display between a bun, allowing yours guests to top as they desire. We’re not done yet! Yet another crowd pleaser are cholay dogs, the chili dog reimagined! Load your dog up with cholay and diced kancha piaj and you’re set! This post was originally published on Masala Mommas.